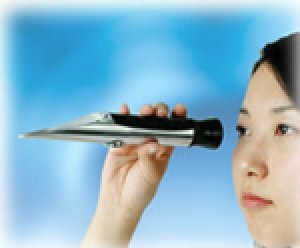 There are four main types of refractometers: traditional handheld refractometers, digital handheld refractometers, laboratory or Abbe refractometers, and inline process refractometers. There is also the Rayleigh Refractometer used (typically) for measuring the refractive indices of gases. In veterinary medicine, a refractometer is used to measure the total plasma protein in a blood sample and urine specific gravity. In drug diagnostics, a refractometer is used to measure the specific gravity in human urine. In gemology, a refractometer is used to help identify gem materials by measuring their refractive index.Gemstones are transparent minerals and can therefore be examined using optical methods. As the refractive index is a material constant dependent on the chemical composition of a substance, it provides information on the type and quality of a gemstone. Classification with a special gemstone refractometer is an easy-to-use method with which the authenticity and quality of a stone can be evaluated. The gemstone refractometer is therefore a piece of basic equipment in a gemological laboratory. Due to the dependence of the refractive index (dispersion) on the wavelength of the light used, the measurement is normally taken at the wavelength of the sodium-D-line (NaD) of 589 nm. Easy to see and be used. Big digital reading. Water resistant. 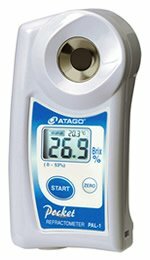 ATA0028B- Ultra-light Digital Brix Refractometer.Temperature/Brix readings in 3 seconds for all products. *Economical. The Master-α, T, H series and ATC-20 are equipped with Automatic Temperature Compensation (ATC), which ensures accurate measurements despite differences in the ambient or sample's temperature. *The MASTER-50H, MASTER-80H, MASTER-93H, MASTER-100H are suitable for samples that are at a high-temperature or samples that contain acidic or corrosive ingredients.